It wasn’t long before Doug James and Dan Robbins came together in a joint effort with Atlantic Beach Press to market his first 36 Craft Master subjects called “Dan Robbins Multiples”. 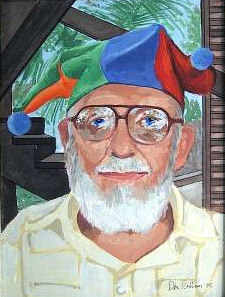 Simply put, Atlantic Beach Press would acquire duplicate copies of Dan’s original 36 subjects, all painted by others. When signed, and dated, these became limited editions, then called, “Dan Robbins Multiples”. These early images, painted with varying degrees of precision have become quite collectible as icons of the genre. Doug James passed away in September 10, 2007. Given the opportunity, I’m not sure if he would have written anything more about himself, except, maybe, “Been there. Done that.” So, I am writing for him. He was my friend, my mentor and most devoted supporter. I suspect he’ll be pleased, knowing that he will be remembered for his contributions to the paint by number genre in general and to this Paint by Number Museum web site in particular.